The news has been rumbling around the web for a while, but as of today, May 22, 2012 Porsche and Forza Motorsport fans can download the Porsche Expansion Pack for Forza Motorsport 4 on the XBox 360. 1600 Microsoft points, or $20 bucks, will get you 30 new Porsches (of which 7 of them are new from Forza Motorsport 3) 20 "brand new Porsche-centric events (in Forza you're life/career is measured in events) and 10 new achievements (things you can do to win points that can be used for future purchases) and way to play in a "Porsche-themed Rivals Mode" (imagine a Cup series on Xbox). If you've never had a chance to drive a Porsche 550, 959, RS Spyder, Sports Classic 911, etc then Forza Motorsport 4 might just be as close as you're going to get. 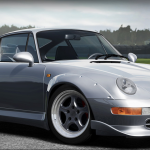 Watch the trailer above to see the Porsches in action (if you can't see the video above, simply visit our site to watch or use our lightbox to view the gallery of pictures below) or check out Forza's site for complete details on all 30 of the Porsches featured. If you don't yet have an Xbox 360 or your own copy of Forza , pick 'em up on Amazon and be prepared to deal with a new addiction. Can Driving Games help you Improve Your Track Skills?